SongBird is an open source music player built on Mozilla’s technology. After being in development for 2 years, SongBird just reached version 1.0 and is looking greater than ever. One great feature of SongBird is that it is extensible with community developed add-ons just like Mozilla’s Firefox and Thunderbird. This lets us add functionality via SongBird extensions and change skins – feathers via SongBird feathers. Supports multiple media formats – MP3, FLAC, Vorbis on all platforms. WMA & WMA DRM on Windows, AAC & Fairplay on Win & Mac. Limited Device Support. Apple iPhones, iPod Touch & Zune, etc not supported yet. And that’s just a sampling of add-ons available and as time progresses the add-ons ecosystem will grow just like Firefox’s and sky is the limit. And of course with add-ons, comes the performance trade-off so be frugal in the add-ons you add to it to keep it zipping along. With the media player market being so crowded as it is, SongBird faces a stiff competition. Yet, it could be appealing to the massive Firefox user base who have learnt to love (or hate) the Mozilla’s interface and will find SongBird easy to navigate and use. What do you think of SongBird? It’s a bit of a resource hog on OS X, otherwise, I love it. Songbird looks pretty cool but since I use both an AppleTV and an iPhone I’m stuck with iTunes. Luckily I find iTunes to do what I need it to, but mashTape and Concerts sounds awesome. I find iTunes to be very restrictive and would prefer something that gave the user more control. Might give it a try with my old skool Nano. How it’s gonna work with stuff from apple? I too find iTunes restrictive this looks like a good alternative. I don’t like these all in one applications that try to be everything to everyone. I prefer to use simpler tools that are more specific in their application. I am still happily using xmms. Not sure if I would use this, but I’m a big fan of having choices. For me, the more software that’s out there, competing with one another, the better for the consumer. And when you throw in words like free and open source, that’s even better. 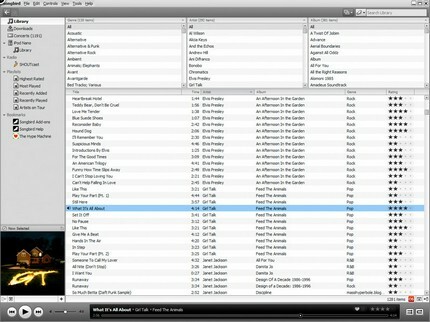 I think highly of iTunes.The tool is good to applicate. I’m a big fan of having more choices, so I think that the introduction of this software can only be a good thing. Also, I like that the Firefox browser allows for much customization with add ons, so I hope similar customizability and diversity of choice will eventually be available for SongBird. Oh this is perfect. I hate itunes and how it tries to take over everything and also its file size. SongBird IS an excellent alternative! Thanks for this nice application. I am waiting for the full release. So keep this good blog up! .-= Avery´s last blog ..Features for Future Mortgage =-. .-= Forest´s last blog ..Pampered Chef Recipes =-.